The pitch that ended Shelby Miller’s no-hit bid Sunday, with one Marlins out remaining, was a 95 mph four-seam fastball. Based on what we knew about Miller before this season, that doesn’t sound surprising. From 2013 to 2014, there was about a 70 percent chance any randomly selected pitch the right-hander threw would be a four-seamer; no other qualified pitcher relied on his four-seam fastball as often.1 Miller’s fastball, like a typecast sitcom actor’s catchphrase, was both the key to his breakthrough and a barrier to further advancement. Mid-90s four-seamers helped make him a top-10 prospect and a third-place finisher in the 2013 NL Rookie of the Year race, but last year, his lack of a complementary pitch tarnished his results and his reputation. Fastballs alone, the maxim says, can’t beat the best hitters. And that centered, fateful fastball on Sunday couldn’t beat Justin Bour, a first baseman who’s 10 days away from his 27th birthday and one at-bat away from his 100th in the big leagues. But of the five pitches Miller threw after Bour’s at-bat to finish off Miami — and Marlins manager Mike Redmond, who was fired after the game — only one was a four-seamer. Miller mixed in a curveball and a cutter against Dee Gordon, who slapped the latter for his league-lapping 14th infield hit,2 and then threw Martin Prado a cutter before getting him to pop out with a sinker. That sinker, Miller’s 94th delivery on an efficient day,3 completed a 6-0 shutout and lowered the right-hander’s ERA, through eight starts and 54 innings, to a league-leading 1.33. Other than Aroldis Chapman, any pitcher with a 1-something ERA is doing something unsustainable. And sure enough, Miller has all the usual luck indicators lined up behind him: a league-low .183 BABIP, a nearly 90 percent strand rate, a lower-than-average home run/fly ball rate. We’ll stipulate that those stats, along with Miller’s ERA, will soon return to a more realistic range. 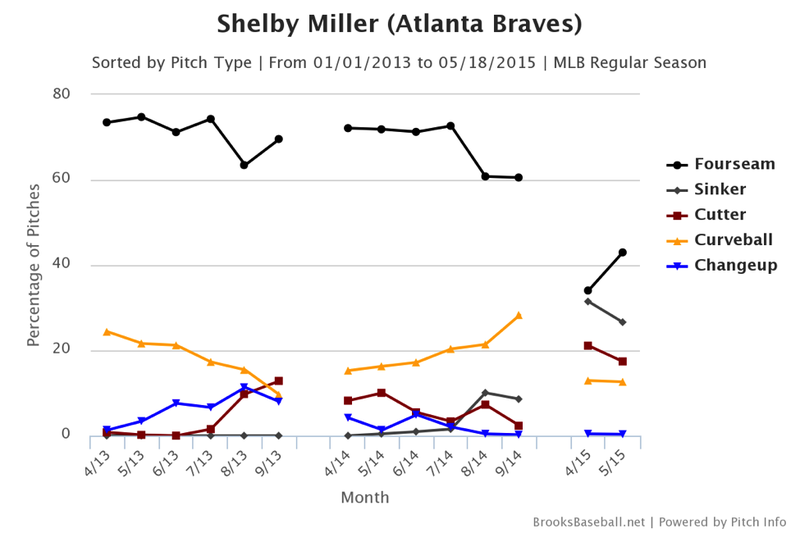 Still, that looming regression shouldn’t overshadow how drastically Miller has remade himself in a short span of time. He still might not make it to the top of a rotation, but if he falls short, it will no longer be because he was too stubborn to try something new. Miller’s lack of secondary stuff was always worrisome. Even during his rookie season, a source with access to batted-ball velocity data told me Miller had been one of baseball’s hardest-hit pitchers, which might help explain why the Cardinals hid him in October. While that more precise information is still proprietary, Baseball Info Solutions rated 35.6 percent of Miller’s batted balls that season as hard hit, the fifth-highest percentage among pitchers with at least 100 innings pitched. He was just ahead of Tony Cingrani, another fastball-dependent pitcher who’s since been consigned to the bullpen, where teams stick one-time starters with limited arsenals. Last season, Miller was hit hard again, and that time his traditional stats suffered. In his first time facing batters in 2014, he held them to a .172/.250/.288 line. But with nothing new to show them, his performance sank to .284/.354/.477 the second time through the order. Atlanta acquired Miller (and Double-A starter Tyrell Jenkins) last November in the trade that sent Jason Heyward and Jordan Walden to St. Louis. Although the impetus for the exchange was Heyward’s impending free agency, it wasn’t the typical present-for-future salary dump. It was a cross between a “challenge” trade, in which GMs put their prospects on the table and bet that the other guy’s will be bigger, and a “change of scenery” trade, in which teams swap disappointing players in the hope that relocation will be the career equivalents of a cold splash of water. Heyward and Miller, both in their mid-twenties, were former elite prospects who’d had some success in the majors — considerable success, in Heyward’s case — but both were coming off seasons in which they’d seemingly lost skills that they’d demonstrated before. Heyward hadn’t hit for power, and Miller, hampered by his failure to find effective pitches to pair with his fastball, hadn’t missed bats. Heyward is still struggling in St. Louis, but we can tentatively consider Miller’s greatest deficiency addressed. Here are his monthly pitch-type percentages, going back to his first full season. Of course, not every new pitch is a good pitch: As much as Miller needed new looks, he probably wouldn’t be any better if he’d replaced his four-seamers with slop. To see how Miller’s newly prominent pitches (the sinker, curve, and cutter) stack up, I found the most similar pitches of the same types thrown by starters last season, based on velocity, horizontal movement, and vertical movement. Those three doppelgängers are Brandon McCarthy’s sinker, Roenis Elias’s curve, and Franklin Morales’s cutter. Those aren’t the most inspiring names — Morales was lousy — but whatever shortcomings the three had, these particular pitches weren’t the problem. The table below shows the three comparison pitches’ 2014 performance in whiffs per swing and grounders per ball in play, rated on the 20-80 scouting scale, where 50 is a pitch of average effectiveness and anything above that is more effective than the typical pitch of that type. Miller’s four-seamer is also an above-average pitch, although it was only barely above average last season, once batters had learned to anticipate and sit on it. This year, Miller’s new weapons have restored the element of surprise, and his four-seamer (which he’s throwing slightly faster) is again missing as many bats as it did during his first full season, when hitters hadn’t yet adjusted to his one-note approach. That uptick in chase rate, coupled with his ability to get ahead more often — Miller’s first-pitch strike rate stands at 65.6 percent, up from 60.6 percent last season — has led to a decreased walk rate and an increased strikeout rate. Even more notably, four pitches with above-average grounder rates have made Miller an above-average ground-baller overall: After two seasons below 40 percent, Miller’s ground-ball rate has risen to 50.4 percent, not a bad development for a pitcher with the best shortstop in baseball stationed behind him. And because ground balls, on average, are hit more softly than liners and flies, Miller is no longer getting hit as hard as he did in St. Louis. Of 158 pitchers with at least 40 batted balls tracked by Statcast this season, Miller’s 85.8 mph average velocity allowed ranks 12th-lowest. In 2013, when Miller was considered one of the game’s most promising young pitchers, he had one average-or-better pitch at his disposal. In 2015, the year after his results slipped and the team that drafted and developed him decided he was expendable, he might have as many as four. Even if none of those pitches would make hitters lose sleep as a solo act, the interplay between them makes each individual pitch more potent. Tiny ERAs are ephemeral, but based solely on stuff, this is the best Miller’s been in the big leagues. Given that he won’t turn 25 until October or reach free agency until after 2018, Miller might be making the Braves happy about the Heyward deal deep into their former right fielder’s next contract. The four-seamer percentages at Brooks Baseball and FanGraphs disagree slightly. Not even Andrelton Simmons could stop Gordon’s season-long homage to Ichiro, though Atlanta’s shortstop did foil a similar single attempt by the original Ichiro in the eighth. This was Miller’s second “Maddux” of the season, which brings this year’s major league total to … two. Among pitchers with at least 100 innings pitched in both seasons. Size Does Matter: Will the 30-30 Player Return to Baseball This Year?